Mount Merapi is the most active volcano in Indonesia and is about 2930m high. And even though we are terribly unfit and do not engage in any sort of exercise on a regular basis, we decided that we wanted to climb Merapi. We left our hotel at 10pm on Tuesday evening and made our way to Selo. Along the way, our car picked up a Polish couple from a hotel near Borobodur. We got to Selo just after midnight and waited around with an Austrian guy, a Dutch guy and a French girl. At 1am, we began our trek. We walked uphill on a paved road for about half an hour and stopped at a look-out point. I was already feeling a bit tired by then and wondering if we had made the right decision to climb Merapi. But we pressed on with the rest. It became clear after a few minutes that the Austrian, Dutch and French were significantly fitter (and younger) so they went on ahead with one guide while we and the Polish couple trudged along with the other guide. Climbing Merapi was the most backbreaking thing I have ever done in my life! Not only was the track steep, the small rocks made it very difficult to get a grip on the track. After some time, I was huffing and puffing, my legs were burning with every step and I wanted to stop and rest after every five steps or so. Adrian must have felt a lot worse because he was carrying about 3 litres of water. Hour after hour went by and the trek didn’t get any easier. I wanted to sit down somewhere and cry from the exhaustion! We made it to the first plateau then took another lifetime to get to the second plateau. We were above 2500m at that point and told the guide that we just couldn’t go on any more. He convinced us to drag ourselves to a ridge 10 minutes away which had a better view and he accompanied the Polish couple to the third plateau. It was really cold there and we were so tired but there was such a sense of accomplishment that we made it as far as we did! Really an unforgettable experience. The way down was not as strenuous but was more difficult and I slipped and fell many times. It was interesting to see the track we had covered in darkness hours before. It took forever and a day to get to the look-out point but I was so happy to see a vehicle waiting there for us because it meant that we didn’t have to walk any further! Our ascent and descent took us about 7 or 8 hours. We had some hot tea and a pancake back at the village before we were driven back to our hotel. My legs were like jelly and I could barely make it back to the hotel room. Good thing we had the foresight to book a massage and foot reflexology session at the hotel spa for after our climb! 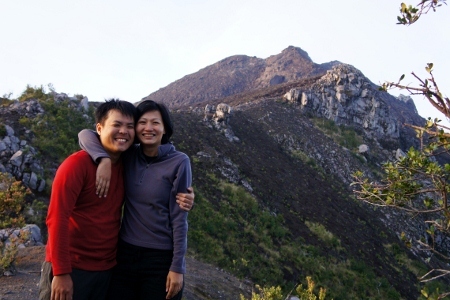 I’m glad we did the climb together but I’m quite sure I will never attempt to climb Merapi again. I don’t think my knees and ankles could take it. This climb was way harder than I expected and I’m not getting any younger. This entry was posted in Uncategorized and tagged holidays, indonesia, nature on November 28, 2012 by delphine. well done! 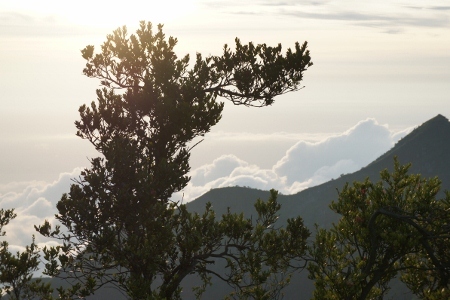 the view is already so breath-taking.. imagine if you reached the peak! !